Page set-up methods affect the way that a worksheet looks to the user or when it is printed. They control features such as paper size, orientation, page headers and margins and gridlines. These methods are really just standard worksheet methods. They are documented separately for the sake of clarity. Set the page view mode. index (int) – The Excel paper format index. If you do not specify a paper type the worksheet will print using the printer’s default paper style. Center the printed page horizontally. Center the printed page vertically. Set the worksheet margins for the printed page. left (float) – Left margin in inches. Default 0.7.
right (float) – Right margin in inches. Default 0.7.
top (float) – Top margin in inches. Default 0.75.
bottom (float) – Bottom margin in inches. Default 0.75. The set_margins() method is used to set the margins of the worksheet when it is printed. The units are in inches. All parameters are optional and have default values corresponding to the default Excel values. Set the printed page header caption and options. 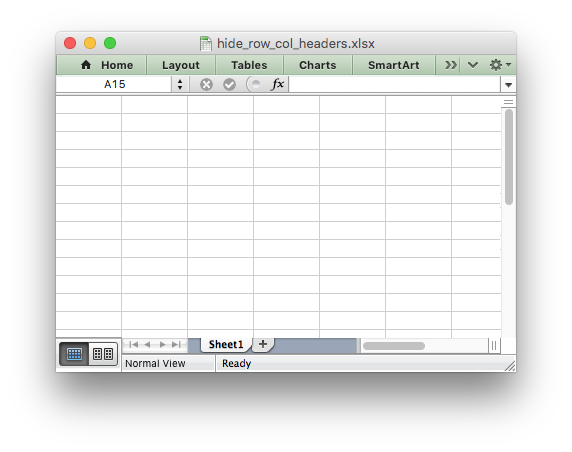 header (string) – Header string with Excel control characters. options (dict) – Header options. Headers and footers are generated using a string which is a combination of plain text and control characters. Text in headers and footers can be justified (aligned) to the left, center and right by prefixing the text with the control characters &L, &C and &R.
.CenterHeader = "&""Times New Roman,Regular""Hello"
$ xmllint --format `find myfile -name "*.xml" | xargs` | egrep "Header|Footer"
margin: (float) Header margin in inches. Defaults to 0.3 inch. image_left: (string) The path to the image. Needs &G placeholder. image_center: (string) Same as above. image_right: (string) Same as above. image_data_left: (BytesIO) A byte stream of the image data. image_data_center: (BytesIO) Same as above. image_data_right: (BytesIO) Same as above. scale_with_doc: (boolean) Scale header with document. Defaults to True. align_with_margins: (boolean) Align header to margins. Defaults to True. The header and footer margins are independent of, and should not be confused with, the top and bottom worksheet margins. When using the image_data_ parameters a filename must still be passed to to the equivalent image_ parameter since it is required by Excel. See also insert_image() for details on handling images from byte streams. Note, Excel does not allow header or footer strings longer than 255 characters, including control characters. Strings longer than this will not be written and an exception will be thrown. See also Example: Adding Headers and Footers to Worksheets. 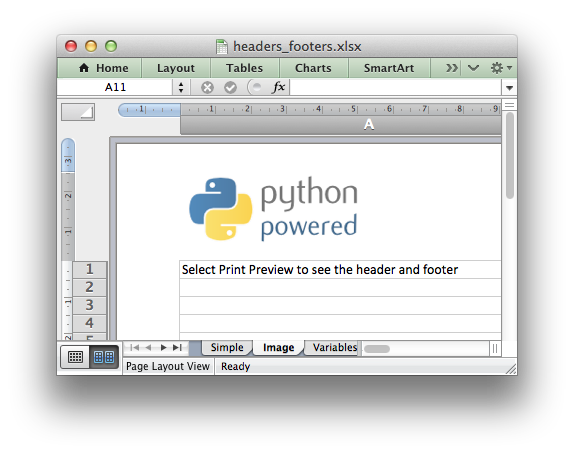 Set the printed page footer caption and options. footer (string) – Footer string with Excel control characters. options (dict) – Footer options. The syntax of the set_footer() method is the same as set_header(). Set the number of rows to repeat at the top of each printed page. first_row (int) – First row of repeat range. last_row (int) – Last row of repeat range. Optional. For large Excel documents it is often desirable to have the first row or rows of the worksheet print out at the top of each page. worksheet1.repeat_rows(0)     # Repeat the first row. worksheet2.repeat_rows(0, 1)  # Repeat the first two rows. first_col (int) – First column of repeat range. last_col (int) – Last column of repeat range. Optional. For large Excel documents it is often desirable to have the first column or columns of the worksheet print out at the left hand side of each page. worksheet1.repeat_columns(0)      # Repeat the first column. worksheet2.repeat_columns(0, 1)   # Repeat the first two columns. worksheet3.repeat_columns('A:A')  # Repeat the first column. worksheet4.repeat_columns('A:B')  # Repeat the first two columns. Set the option to hide gridlines on the screen and the printed page. option (int) – Hide gridline options. See below. This method is used to hide the gridlines on the screen and printed page. Gridlines are the lines that divide the cells on a worksheet. Screen and printed gridlines are turned on by default in an Excel worksheet. Hide screen and printed gridlines. If you don’t supply an argument the default option is 1, i.e. only the printed gridlines are hidden. When you print a worksheet from Excel you get the data selected in the print area. By default the Excel row and column headers (the row numbers on the left and the column letters at the top) aren’t printed. Set the option to hide the row and column headers in a worksheet. Set the print area in the current worksheet. first_col (integer) – The first column of the range. last_row (integer) – The last row of the range. last_col (integer) – The last col of the range. -1: Row or column is out of worksheet bounds. This method is used to specify the area of the worksheet that will be printed. worksheet1.print_area('A1:H20')     # Cells A1 to H20. worksheet2.print_area(0, 0, 19, 7)  # The same as above. worksheet3.print_area('A1:H1048576')  # Same as A:H.
Set the order in which pages are printed. Fit the printed area to a specific number of pages both vertically and horizontally. width (int) – Number of pages horizontally. height (int) – Number of pages vertically. worksheet1.fit_to_pages(1, 1)  # Fit to 1x1 pages. worksheet2.fit_to_pages(2, 1)  # Fit to 2x1 pages. worksheet3.fit_to_pages(1, 2)  # Fit to 1x2 pages. The print area can be defined using the print_area() method as described above. worksheet1.fit_to_pages(1, 0)  # 1 page wide and as long as necessary. Although it is valid to use both fit_to_pages() and set_print_scale() on the same worksheet in Excel only allows one of these options to be active at a time. The last method call made will set the active option. The fit_to_pages() will override any manual page breaks that are defined in the worksheet. When using fit_to_pages() it may also be required to set the printer paper size using set_paper() or else Excel will default to “US Letter”. Set the start page number when printing. start_page (int) – Starting page number. # Start print from page 2. Set the scale factor for the printed page. scale (int) – Print scale of worksheet to be printed. The default scale factor is 100. Note, set_print_scale() does not affect the scale of the visible page in Excel. For that you should use set_zoom(). Note also that although it is valid to use both fit_to_pages() and set_print_scale() on the same worksheet Excel only allows one of these options to be active at a time. The last method call made will set the active option. Set the horizontal page breaks on a worksheet. breaks (list) – List of page break rows. The set_h_pagebreaks() method adds horizontal page breaks to a worksheet. A page break causes all the data that follows it to be printed on the next page. Horizontal page breaks act between rows. worksheet.set_h_pagebreaks()  # Break between row 20 and 21. Note: If you specify the “fit to page” option via the fit_to_pages() method it will override all manual page breaks. There is a silent limitation of 1023 horizontal page breaks per worksheet in line with an Excel internal limitation. Set the vertical page breaks on a worksheet. breaks (list) – List of page break columns. The set_v_pagebreaks() method is the same as the above set_h_pagebreaks() method except it adds page breaks between columns.